Ellen and Jason gave me a great birthday gift this January. It was on back-order, so it just arrived today! It is a super sleek cat dish holder. A gift for me and my crazy cat Nochie (this is fitting as I consider Ellen and Jason to be Nochie’s god-parents, ha ha). I can’t wait to go home and feed him tonight. It will be a nice design item to add to my kitchen — replacing the tupperware and old plate that he currently eats out of (we lost his real bowls in Christmas travels). Nochie is not the only cat who will be eating in style. 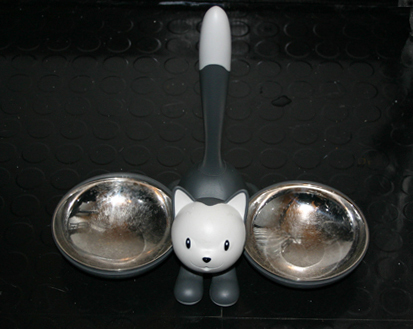 The MSLK cats —Pinky and LuLu eat lunch in the studio out of an Alessi Cat dish that they share.